NEW DESIGN! This is the new version of the PAT01 and has been dramatically improved! We now have a new amplifier in the units internals which boosts the regular X10 signal sent by the PAT03 to up to 10 TIMES the power as before. This means a more powerful and reliable X10 signal. With longer distance and less fuss with electrical noise, the PAT03 is a worthy upgrade for any X10 system! In addition to a boosted signal, this unit has AGC (Automatic Gain Control). This essentially reduces the noise surrounding the unit, also adding to a more reliable X10 signal through your home! Add RF Remote Control to Your X10 Devices Converts Radio Frequency signals from X10 PRO wireless controllers such as the PHR04 , PHW04D, and PHR03 to X10 control signals. Now you can easily control lights and appliances from up to 100ft away - even through walls - with this X10 PRO Transceiver Module. 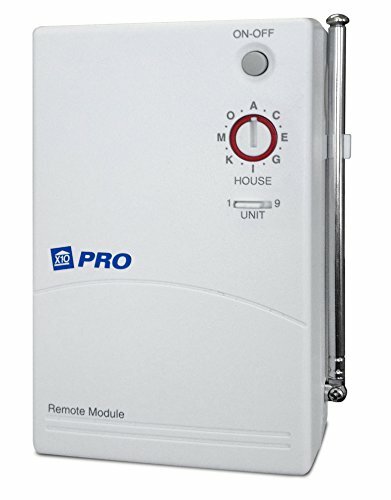 This powerful module works with handheld wireless remote controllers such as the X-10 PRO 16-Plus Remote (PHR03) to control its built-in switched outlet and up to15 additional X10 modules via the powerline. You can also control the Transceiver Module by other X10 powerline controllers such as the X-10 PRO Mini Controller (PMC01).